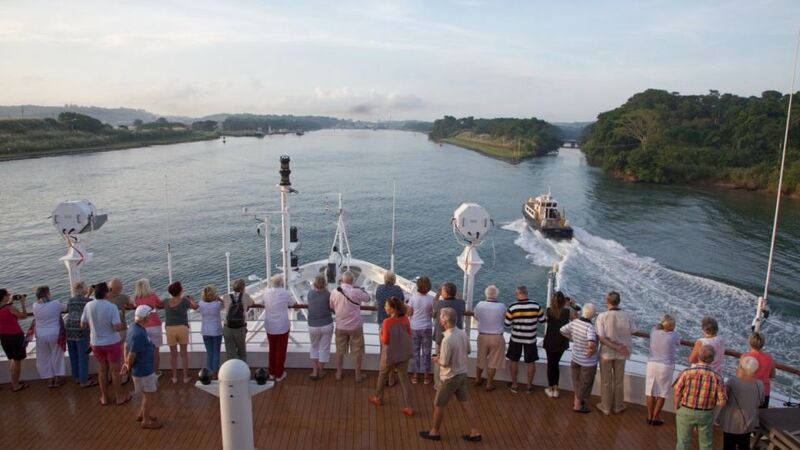 It might be more commonly associated with commercial shipping, but the Panama Canal also provides a once-in-a-lifetime experience for cruise ship passengers. In one indelible day on a ship, the Panama Canal undoes what nature achieved over millions of years. For the narrow strip of land between North and South America only slowly rose to separate the Atlantic and Pacific oceans three million years ago. The Panama Canal provides one of the great shipping shortcuts — 77km through the Central American isthmus that saves sailing to the bottom of South America and rounding Cape Horn. Before the canal was opened in 1914, it was a 22,000km sea voyage from the east coast of the US to its west coast. The Panama Canal reduces that to 9000km. But it was not without cost. Respected Latin American historian Francisco Matus tells me that 22,000 people died building the Panama Canal, most from yellow fever and typhoid. The French first started in the 1880s, though the work faltered and stopped in 1889. The US later stepped in, leveraging Panama’s desire for independence. There are cartoons of US president Theodore Roosevelt standing astride Panama, ready to swing a pickaxe and break through the Central American isthmus, ships queued either side. And so, in 1903, the Republic of Panama was created at a meeting in the Waldorf Hotel in New York, Panama declared independence from Gran Colombia, the US sent its fleet to make sure that went OK, and the US Army Corps of Engineers started work within 12 months and finished 11 years later. The key to the Panama Canal is Gatun Lake — a 423sqkm reservoir created in 1913 by damming the Chagres River. The lake’s surface is 26m above the Pacific and Atlantic oceans either side. If ships are heading south from Colon, on the Atlantic coast, to Panama City, on the Pacific coast, the series of three Gatun Locks, each rising and falling about 8m, take them up to the lake level, and the three locks of Pedro Miguel and Miraflores bring them down again. Two men row out to bring tow lines to the ship, and four, streaming out from each corner, are hooked to $US2.5 million locomotives that hold the ship in the middle of the lock as it passes through. The centre section of the “canal” is, in fact, 24km across Gatun Lake, ships following a specific route which even has named turns — Trinidad Turn, Orchid Turn and Frijoles Turn among them. They then pass down narrow, man-made reaches; the 250m wide Gaylor Cut being the most dramatic, just as it had been the hardest to construct. We are lucky, with a warm and clear day — it’s rainy season but not raining. I’m on Ponant’s Le Soleal and Captain David Marionneau (pictured at top) invites me to the bridge as we approach through the Pedro Miguel locks. A series of local pilots will come on board to add local knowledge throughout the day. For all the myriad technology on Le Soleal’s bridge, the current pilot navigates by eye. When Captain Marionneau asks him about the correct speed for approaching the locks, he says that if the men on the docking lines are running, the ship’s going too fast. They should be walking. Any more advice as we approach the slightly angled quay beside the lock? Captain Marionneau handles the day with calm, charm and clear communication. But he describes it as “very intense”. And it is an expensive day. It is reported that the average fee is around $US55,000 ($72,000) but big ships might be charged between $US100,000 and $US200,000 to use the canal. The Panama Canal was progressively given by America to the Panamanian people, with the final handover in 2000. The canal company makes more than $US2.6 billion a year, which covers maintenance, employing 13,000 people and reinvestment in infrastructure like the new locks. About 15,000 ships use the Panama Canal every year — nearly “40 a day, two an hour”, as the locals like to say. While for commercial shipping, the Panama Canal is a working shortcut, for me on the bridge, and for other guests on cruise ships, it is probably a once-in-a-lifetime experience. It feels like a secret path you knew as a child. It is an unforgettable day on a ship. The “new Panama Canal”, a $US5 billion project which was officially opened last year, is actually just new sets of much bigger locks parallel to the original ones. The 103-year-old locks are 33m wide and 304m long — the new Panamax and Neopanamax locks are 55m wide and 427m long, and 18m deep. They can handle big ships carrying 12,000 containers. The new locks also cleverly reuse 60 per cent of the millions of litres of water they need for each fill. They use 7 per cent less water than the old, smaller locks. Apart from the new locks, the bigger ships that can now use the Panama Canal actually follow the same path as other ships. This first full season for the Expanded Panama Canal, as it is being called, officially began on October 2. In this first full, 2017-2018 cruise season, the expanded Panama Canal expects 235 ship transits. The new locks enable big cruise ships like those of Carnival Cruises, Princess Cruises, Norwegian Cruise Line, Viking Ocean Cruises and Silversea to use the canal. The Panama Canal company’s international trade specialist, Albano Aguilar, says: “In addition to the existing locks, cruise lines now have the option to include the Expanded Canal as part of their itineraries. Panama has an unemployment rate of less than 5 per cent, with 77 per cent of its income coming from services. Panamanian guide Alexis Flores later tells me pilots can earn $US500,000 a year. Lego has a limited-edition Panama Canal set. It was originally only available in the shop at the canal itself but is now available worldwide, through the Panama Canal online store. Only 40,000 will be made.